Yesterday we held our first live chat with members of the Theatre, Event and Venue Management Slack Group. Our topic for the month was best practices in pre-production. We compiled the conversation into a blog here. It’s been lightly edited for continuity and readability. Alex Bender: Production coordinator for the Office of Visual and Performing Arts at Millersville University, a veteran tourer and a graduate of Penn State’s BFA stage management program. Ashley Trupp: A self-described recovering stage manager & production manager from NYC who is now the Manager of Events, Partnerships & Advocacy at MakeMusic, a software company that focuses music education and notation tools in Boulder, Colorado. Herman Montero: Production manager for the Adrienne Arsht Center for the Performing Arts in Miami, Florida. Borja Brown: Production manager at the University of British Columbia’s Theatre and Film department. The nature of the event and organization can have drastic effects on both the length of the planning process as well as the ability to make quick decisions closer to the date of the show. Also, regardless of your lead time, many of the same challenges still apply. Jackie: How far ahead do you start planning for a season, production, or event? Ashley: I start planning my season in March for an October start. The majority of my trade shows are music educator association conferences, with dates that are pretty well set from year to year. My “show season” is on a school type schedule, but our budget is on a calendar year, so there is a bit of guesswork and re-forecasting that happens during the summer. Ryan: 7 months out seems like a pretty nice runway. What are your biggest challenges when adding a new conference? Ashley: Honestly, physical & human resources. Mel: Seems like there would be a lot of squeezing in and re-arranging. Ashley: There is. I trans-ship exhibits from show to show, state to state, so once the train leaves the station it is hard to add things in. Ryan: Coming from theatre that must have been quite a shift where things change on such short notice. Jackie: Bender, how far ahead do you start for your season at the university? Bender: Our Director has the season planned by around November for the following academic year. Then, the Music and Theatre Depts. submit their dates. After that, we have some events/clients that hold yearly events as well as camps and such. Once they’re all in the calendar (by around January) we open it up to the rest of the world. Other university departments, outside clients, and student organizations all want to use our spaces, but the calendar is already jammed by this point. However, that doesn’t seem to stop us from booking things! Space is always limited. There are a variety of ways to address situations where 2 groups want to be in the same space at the same time. Having a set priority can be really helpful. Ryan: How do you handle situations where multiple people want the same space on the same days? First come first serve? Ryan: Herman, I know we’ve discussed this before. Herman: Yeah. My planning for our Resident Companies start 5 years in advance. Then our Programming department starts 1 year out. Outside Rentals which could be shows or events is a complete jungle! They can show up the day before or a year out and equally vary in size. Bender: Our issue is that we have multiple spaces, but only 1 A/V focused full-time technical coordinator and 1 – LX, plus a hand full of student workers of varying skills and variable schedules. We say yes more than we should, honestly, and push our resources past their limits. Mel: I’m sure, Herman, that the outside rentals don’t start really solidifying until much later. Do you hold specific slots open for those types of events? Herman: Everyone pretty much has to work around the Resident Companies’ dates. They get first dibs at the calendar. For all available open dates it is a first come, first serve basis. If another company wishes to get the same date, we start off a list of interested parties and whomever is on deck can challenge the date from whoever has it first. Ryan: What do you do when one of your “regulars” wants to add a date for an extension or a gala? Jackie: That sounds like a battle royale! Herman: The more information I have beforehand the better. There isn’t such a thing as too little. The more I know the more I can work out my resources in advance. If a “regular” wants to extend, they too enter the “Battle Royale” if needed. No one is safe from it. Haha. There are a variety of ways different organizations gather information for upcoming productions. Using electronic forms has the potential to help the process. 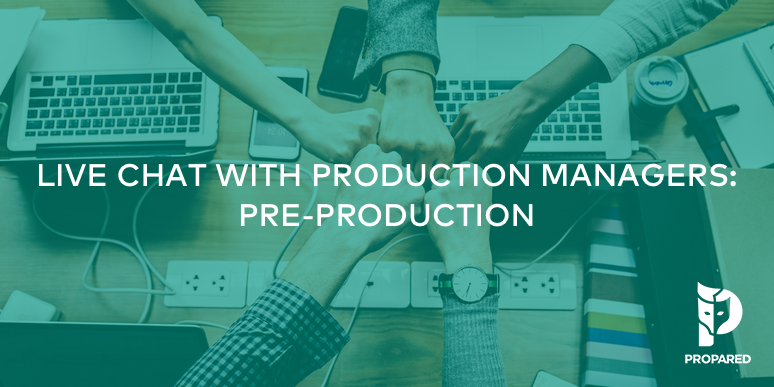 Jackie: Circling back to pre-pro, how do you go about gathering production requirements from others? Bender, what is that process like for you? Bender: We have a shared drive and each event has a folder. When I’m ready to advance, I go to the folder and hope the contract and tech rider are in it! Contracts and red-lining riders are all done above me. With the info I have, I email/phone to advance. Jackie: Google Drive seems to be a great tool for aggregating all of the large show files and info that come with multiple bookings, I’ve been using it a lot recently. Bender: In my perfect world, I’d have the advance done 6 – 8 weeks before the show date, but that’s really just a fantasy. Maybe that timeline is unrealistic for anyone. Ashley: Lol! My issue that that the whole season is one big machine so reacting quickly is a little difficult. I say “No” more than I would like to. Ryan: Good point, Ashley, it’s almost the opposite set of problems (challenges). Mel: Bender, Are there specific questionnaires that you use to ensure they are providing you everything you need or are you relying on just what they decide to provide you initially. Bender: You know, I have looked into a standard advance form, but our offerings are so varied that there’s no one-size-fits-all. I did create a form to try to get all the info. down in one place, but it ended up being 3 pages long and for some reason, I can’t get anyone interested in more than a one-page document. Ashley: Bender, are you using paper forms or Google Forms? Mel: Electronic forms could speed up that process since people seem less and less inclined to scan documents in. And it could assist in the time it would take to get the data into a useable format. We are often faced with the seemingly impossible task of reconciling an impasse – be it a conflict between two people or between a design choice and physics itself! We learned that open, honest communications about hard choices can take you farther than you ever thought. Jackie: So to jump into our next question, tell us about a situation where someone in the room made a request that was unfeasible due to budget, scope, or other situational aspects. How did you work through it? Jackie: Thanks, Herman. Ashley, what do you do when there’s an unfeasible request for the budget/time that’s given? Ashley: Tell the sales manager that asked for it that the laws of physics will not allow me to complete his request and then add it to the schedule for the following season. Herman: Essentially, you just find the next best solution that most closely resembles the desired request. Ryan: That’s always been my route. Always have an alternative. Mel: Herman, I guess with a venue like the Arsht Center as well, there is already a bit of an understanding of the scope and scale /or budget required to do an project there. I remember this was not always the case with the shows I was working on in NY. The expectations didn’t always align with the reality of the space because it was unfamiliar to everyone. Ashley: Since I’m in a for profit entity, if I can make a case for spending the $$, I can usually get approval. Ryan: We had a request once from a designer who wanted the DJ booth to literally float in mid air on a pier! The scenic evolution of that DJ booth over the weeks was one of my favorite moments as a PM. Needless to say, it didn’t float, but we found a beautiful design as an alternative. Bender: We have a hard time saying no, too. Example – We had a request for a conference, on a weekday, during classes, in a venue that’s not set up for conferences. Despite our protests, they univ. dept. got the Provost involved and at that point you can’t really say no. So, we make it happen. Ryan: That’s a great example, Bender. Herman: We’re currently teaching an annual show that we do called, “Kitty Hawk”. It’s a story about the Wright Brothers and their journey into flight. The proposed design was to have the glider fly over the audience with 2 actors riding it. The show takes place in our Concert Hall. No flyhouse or rigging allowed anywhere. Needless to say it didn’t happen. Ryan: Herman, what alternatives were you able to offer? If any? Projections? Herman: That’s it! The glider parks itself in front of a projection screen that then simulates the take off while the Actors “act” through the motions on the glider. Jackie: Great solution without endangering the audience, we like those. Mel: Having honest conversations with design about money and resources, but also taking their artistic vision seriously. Borja: We use a form with our students designers thats costs out each element, that way they can see where their resources are going and decide which are the most important. Jackie: Oh that’s really good! Ryan: Borja, that’s an amazing thing to do for students. Injects a little more reality into the situation. Jackie: And it lets them make the choices, instead of saying no. Herman: I always make it a point to be very honest & open about the budget. It gets created before the design and will ultimately inform what the design will look like. Borja: and help get rid of those elements that (we as staff) know won’t work a little earlier in the process…. Herman: Borja, that’s a really cool idea. Borja: We do that as well – in a sense the budget is the ‘boss’ and makes the hard decisions so that we as PMs don’t always have to be the bad cop. Ryan: Genuine honesty can break down so many barriers and money can often be a sensitive topic. Ashley: Talking through all the options with all stakeholders is the most useful thing I’ve found. I hate saying “no” but if I can get to the root of the request, I can usually find an alternative. Mel: There is also a bit of service to be given by educating designers about the costs of specific concepts too. Being up front with budgets and costs cuts down on so much of the emotional decision making as well. Herman: It you keep all conversations open & honest, when you truly have to say no or cut an idea, everyone else seems to be more understanding about it because they know where you’re coming from. Borja: not just designers – directors too! And that was it for our first Live Chat! If you’d like to be part of the discussion you can join the Theatre, Event and Venue Management Slack Group here.